A flexible and useful unit but perhaps Roland limit its appeal due to their chosen price point. Covers a wide range of sync needs. Swing can be added to 'straight' beats. Flexible additional CV and analogue trigger options. Could be more user friendly. Transposing function only supports V/Oct system synths. The analogue revival continues, and with it the need for boxes that many of us thought were relegated to the 'used' pages of auction sites - synchronisers. In the '80s these became essential items to run drum machines, sequencers and tape machines in synchronicity. The main issue they attempted to overcome was the lack of compatibility between digital (MIDI) and analogue clocking systems, as well as differences between manufacturers. Another problem, related to tempo synchronisation of music kit to analogue tape, has largely been left behind with the dominance of DAW-based studios. However, there still remains a requirement to get MIDI clock (via DIN or USB) to talk to older analogue pulse-based brethren. "The master tempo clock can be derived from the SBX-1 itself or via the USB, MIDI or DIN inputs"
We haven't even touched on playing actual notes, where MIDI to CV-Gate conversion is required to drive a whole panoply of analogue mono synths both young and old. And even here there are conflicting standards in both the CV and Gate specifications of different implementations. So, there's quite a lot for a sync box to do, and even more when, like the unit reviewed here, you throw-in CV and Gate options as well. 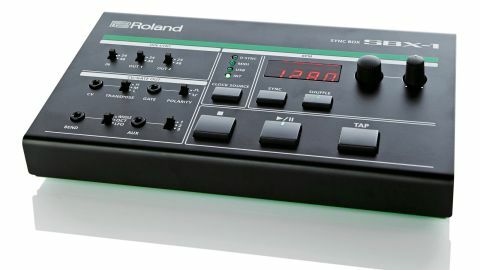 The Roland SBX-1 takes its visual cue from the Aira range - so it's black, white and green all the way. The most familiar sockets on the back panel are USB and the MIDI In and Outs (x2). Incidentally, the SBX functions as a basic 1in/2out MIDI interface when attached to a computer. Next we have the analogue DIN Sync connectors - like MIDI there is one input and two outputs (all three of which can be switched independently from 24 to 48 PPQN via front panel switches). The master tempo clock can be derived from the SBX-1 itself or via the USB, MIDI or DIN inputs, whereupon it is propagated to any other attached devices. A neat aspect of having the SBX in the sync chain is its ability to add shuffle (via a dedicated knob) to otherwise rigidly clocked sources. This Roland isn't just a sync box - the upper portion of the front panel is given over to traditional CV/Gate duties. The CV output can be transposed across a three-octave range, and the polarity of the Gate signal can be inverted, but there is only support for synths that employ the (albeit more common) V/Oct system. This is a real shame, and means units such as the Korg MS-20 are left out in the cold unless you buy an additional converter box. On the upside two additional 1/8-inch sockets provide further CV control options, that can output variable CV, internally- generated LFOs and additional triggers. The SBX-1 serves a useful purpose and fulfils the synchronisation aspect of its role well. The only downside is that much of the customisation is accessible only through a rather long-winded process of button pressing and knob twisting to edit parameters on the somewhat limited numerical display - very '80s! Given the price, we can't help but feel that Roland could have made the unit more user-friendly, or perhaps reduced its feature set in return for a much lower price point.